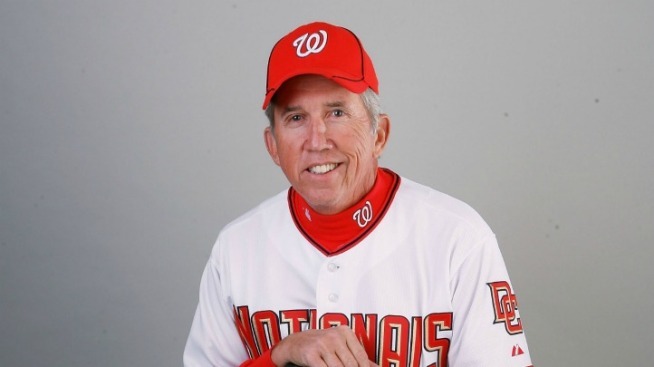 Meet Davey Johnson, successor to Jim Riggleman and manager of your Nats through the end of this season. Johnson was named manager Sunday and on Monday officially began his time as the Nats manager -- with a loss. Sigh. Johnson has been a senior advisor for the Nats since the end of the 2009 season. The three-time World Series Champion has a history of breathing new life into struggling ballclubs. We can only hope he will do the same here in Washington. Or at least keep the Nats as hot as they've been over the past month. He first managed for a struggling Mets ballclub in 1984. They hadn't won a pennant since 1973 and Johnson led them to five-straight seasons with more than 90 wins, including a World Series Championship in 1986. He was the first National League manager to win more than 90 games. The Mets, however, didn't quite approve of Johnson's easy-going management style. He was fired in 1990 amidst early-season struggles for the team. He still remains the Mets' winningest manager of all time. Johnson was then hired by the Reds and led them to an NL Central title in 1995. Despite Johnson's success in his stay in Cincinatti, Reds owner Marge Schott announced early in the 1995 season that Johnson would not return as the manager next season. This wasn't the only time Johnson had a run-in with an owner. In 1997 while managing the Orioles, Johnson fined Roberto Alomar for missing a team banquet and an exhibition game against the O's Triple-A club during the All-Star Break. He ordered that Alomar pay the fine to a charity of his wife, Susan's, choosing. Alomar, after being informed by his lawyers of a possible conflict of interest, paid the fine to a different charity. Orioles owner Peter Angelos asked Johnson to admit that he acted recklessly by not leaving the decision to fine Alomar up to him, but Johnson refused and resigned on the same day that he was awarded the American League Manager of the Year Award. Based on Nats General Manager Mike Rizzo's praise of the 68-year-old, we probably won't be seeing anything like that during Johnson's tenure as the Nats skipper. "Davey's a perfect fit for this job at this particular time," Rizzo told the Washington Post. "He's a guy with a track record that's beyond reproach. He knows the system, he knows the staff, he knows the major league club and he's a terrific baseball guy and a proven, winning manger." Some worry that Johnson's age could make it hard to manage such a young team, but Rizzo doesn't seem concerned. Johnson was a Gold Glove second baseman in his playing days, playing for the Orioles, Braves, Giants, Phillies and Cubs. In addition to his World Series Championship with the Mets, Johnson has taken four other teams to the playoffs and has an overall 1,184-889 managerial record.